Since Sunday, March 18th, 2018 the Bitcoin price had managed to recover a significant amount. 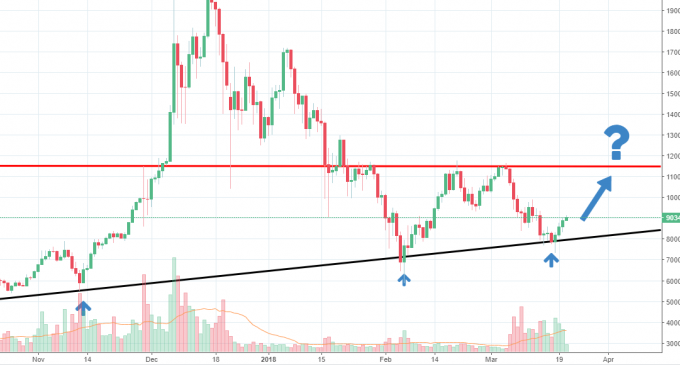 In our last weekly crypto analysis, which had been published on Sunday, we’ve talked about the potential for a recovery, as the Bitcoin price had reached a key ascending trend line. There was also some news that supported the move, but as we’ve marked on the chart above, you can see how the buyers have responded several times to the bullish trend line. Our take is for a continuation higher, as the oversold conditions could motivate buyers to buy Bitcoin. As we’ve covered in our previous news article, the Financial Stability Board released a letter a few days ago, where cryptocurrencies were described as not being dangerous to the financial system, since their total market value does not even cover 1% of the global GDP. Although the board advised for a globally coordinated approach towards cryptocurrency regulation, investors had not taken the statement as harmful, which is confirmed by the Bitcoin price reaction following the release of the letter. The news came right when the price reached our ascending trend line, which was a good confluence of buying indicators. However, there is still more ground to recover. At a particular point in time, Bitcoin dropped more than 20% and the move accelerated towards almost 40%, the price dropping from our key resistance area located at 11,500 towards 7,300. We suspect the move has the potential to extend further and maybe it will head again towards our key resistance, marked with red on the chart. Looking at the overall picture, what stands out since the beginning of the year are the red candles. That communicates that sellers are the ones in control in the long run, so buyers should have a cautious approach. The high volatility we’ve seen on the price of Bitcoin could continue, with moves of 20% or even higher. Could cryptocurrencies start to rally is a question that some of you may ask and the possibility of solid gains in the next few days is high, from our point of view.